This weekend the town of Old Lyme will host the Midsummer Festival, a two-day celebration featuring concerts, exhibitions, and a heavy dose of Connecticut food, farms and food writers this Friday, July 30 and Saturday July 31 in the town’s historic district. In addition to concerts, exhibitions and workshops for kids, the Midsummer Festival boasts a great-line up for gourmands, which is where we gladly come in, beginning with an en plein air market featuring Connecticut grown produce and products. 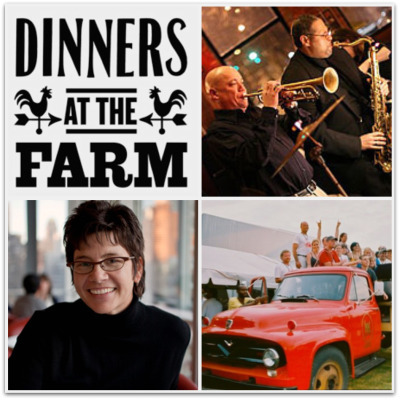 On Friday evening, Dinners at the Farm will be serving picnic dinners out of their “Chuckwagon” for $25 a person and will be back at it on Saturday serving breakfast and lunch in an outdoor cafe on Saturday for Festival-goers. Saturday will also feature two authors near and dear to our CTbites hearts. Award-winning New York Times food writer Kim Severson will sign copies of Spoon Fed: How Eight Cooks Saved My Life from 10 am to 12 noon. Michel Nischan, owner and founder of Westport's Dressing Room, will be on hand from 1 to 3 pm to sign copies of his latest book Sustainably Delicious: Making the World a Better Place, One Recipe at a Time. Stock up on some Connecticut produce, meet some of Connecticut's culinary stars and enjoy all this picturesque shoreline town has to offer. For a full list of events and vendors, visit Old Lyme’s Midsummer Festival website.